Before I begin this post I need to make it clear that when I took all these pictures below I NEVER intended to put them in a very public place. Most of the time I take a picture to send to Luke or my mom only, however after trying 5 different baby carriers I decided to share my experience with each and the pictures help, regardless of how I look in them. And I'm totally not a girl who only shows herself looking perfect. That really gets on my nerves. So here I am, un-showered, unkept, and in my daily outfit of tank tops and comfy pants. Word. 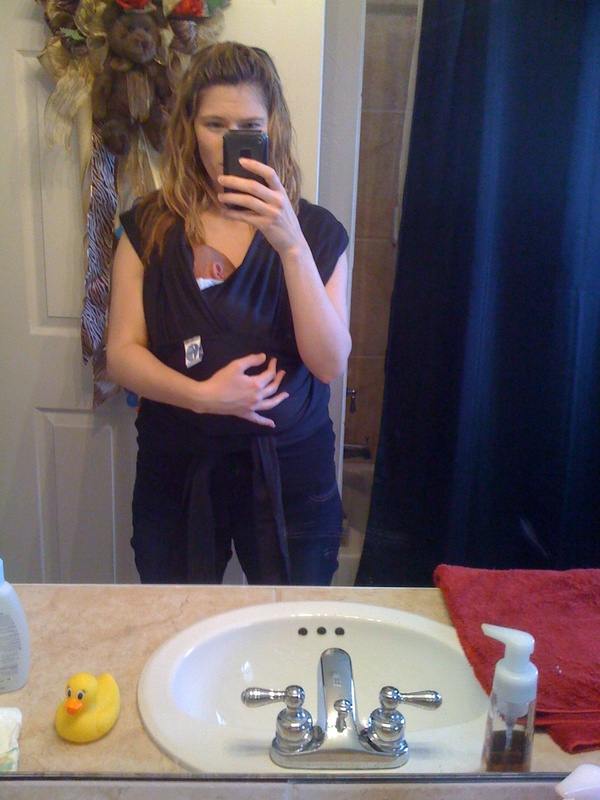 My baby carrier story begins with the BabyBjorn. 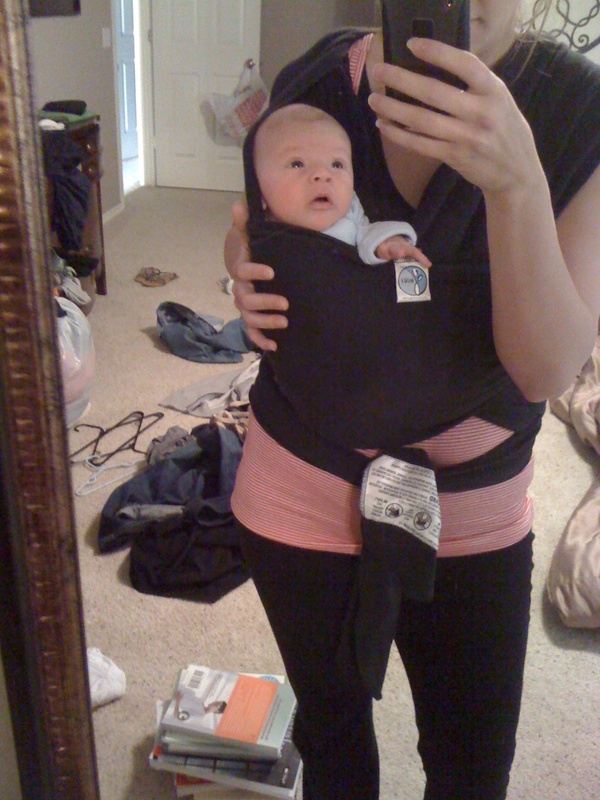 You see before I was pregnant I never gave baby carriers much thought. I had a friend at church who used some sort of sling to carry her baby in but other than that I never thought about them or thought I would want one. Then in October Luke and I went on a little trip and while at the airport I saw the cutest dad carrying his baby in a BabyBjorn. As soon as I saw that cute dad I knew I needed a BabyBjorn. Not for me to use but for my cute husband to carry our cute baby in while at the airport. So I added it to our registry and never thought about a baby carrier again. Somebody gifted us with the BabyBjorn and I put it in the Eli's closet to use once he arrived. Again, not giving another thought to baby carriers. I had a BabyBjorn I was set. Fast forward a couple of months. Baby Eli was here and I realized two things. So one day I remembered that I had the BabyBjorn tucked away waiting for Luke to use one day at the airport (p.s. we have no future trips planned, nor does Luke have a clue that I'm planning on him using the Bjorn). So I went and got it and put baby Eli in it. I liked the BabyBjorn but it wasn't what I had in mind for a carrier for myself. In my opinion this carrier would be good for use at an airport (I mean how many times can I beat a dead horse?) or hiking (I've never hiked in my life) or at the zoo or something like that. But I wanted something for more daily use, such as shopping, chores around the house etc. Then I remembered that I already had a sling. 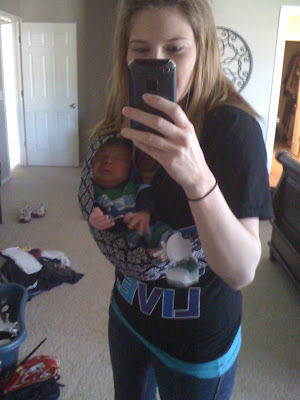 While I was pregnant I received a free code for a Seven Sling. I was so excited when I pulled out my sling. I thought it was perfect and just what I was looking for. I read the instructions about 20 times and could never get it right. Then I figured out I had ordered the sling way too small. I went by the sizing code but clearly I was wrong. 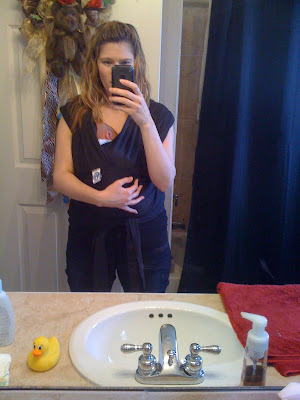 There was no way this was going to work so I started researching wraps/carriers/slings. I had NO IDEA there were so many options. Seriously there are a ton of options for moms looking for something. I still liked the idea of a sling so I eventually decided on the PeanutShell Sling. From what I could tell it was perfect. One thing I love about the PeanutShell Sling is how many cute fabric options there are. Very stylish. I loved this grey color and thought it would be easy to keep clean. Plus it had super thick sides that seemed like it would keep Eli safe. I thought this was a winner for sure. I brought it home and tried it on lots of times. I could never get Eli in it just right. His chin was always against his chest (which is a big no-no as it disrupts breathing). He looked very uncomfortable and I felt like he was far from my body. There was no way I could go shopping or run errands with him in this and feel like he was safe. It felt like he was just swinging around in front of my body, not very secure. So I returned it to the store. I then realized that I needed something that was close to my body. Lots of people on Twitter had been raving about the Moby wrap but it seemed so complicated to me. But after some persuading by friends I decided to give it a try. The Moby wrap is great because you can get it at Target. Anything you can buy at Target gets bonus points from me! (however my Target only had one color, black). I was sold. I loved the Moby Wrap. I thought I was done with my baby carrier search, but overtime I grew frustrated with the Moby. First off, it is just one giant piece of fabric, so no matter where you put it on fabric is going to drag on the ground. I learned this the hard way at church one day during service. During the sermon I stood up and tied and retied this thing about 20 times trying to get it perfect. Inappropriate timing? I thought it would be a quick thing but it took several tries. You have to get the fabric JUST perfect. It can't be too loose or too tight. Again I'm not sure how I got it perfect the first time. Every time I used it I would end up adjusting it a million times before getting it right. This started to get very frustrating. I still liked the Moby but hated that if I didn't get it just right it felt all wrong. I decided to try one more carrier, the K'Tan. It is similar to the Moby but has much less fabric. Ding, ding ding!!! We have a winner. The K'Tan is everything that I love about the Moby without all the fuss of messing with the excess fabric. The K'tan keeps Eli close to my body and he feels very secure in it and he always looks comfy. Plus, like the Moby you can wear it several different ways. So far I've done the cradle position, and let him sort of sit up in it (sort of since he can't hold his head up yet). I'm definitely a fan of the K'tan and have already used it a lot. Look how much Eli loves it! I will probably use the Moby from time to time as I think it is better for the newborn hug hold than the K'tan is, but the K'tan is definitely my go-to wrap. 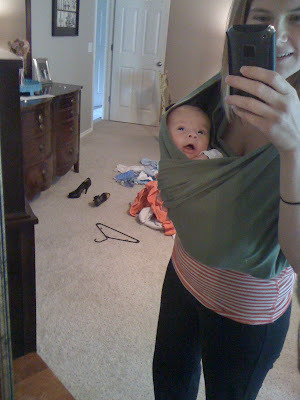 So if you are thinking of getting a carrier/wrap/sling for everyday use I highly suggest the K'tan first and Moby second. You can't really fail with either but I prefer the K'tan. This was crazy long and boring, but I hope that it helps someone somewhere. And yes, my bedroom is always messy. 1. When I was pregnant the hair on my legs quit growing. Like completely quit growing. By the time Eli was born I hadn't shaved my legs since around Christmas and they still had no hair on them (for real). I was hoping they would stay that way and I would never have to shave again but slowly the hair has started to return. Darn. 2. I truly believe that you "reap what you sow" and right now I am living proof of that. My poor body is reaping the affects of how I ate during pregnancy. I've honestly always been a person who can eat what I want, so that's what I did during pregnancy. APPARENTLY I can't do that anymore. Stupid absent metabolism. Oh if I could turn back time. Well I would probably eat bad because I enjoyed it but I am reaping the effects of my poor food choices. 3. Isn't it weird how different tooth brushes feel totally different in your mouth? If somebody replaced your tooth brush without you knowing you would TOTALLY be able to tell once you started brushing your teeth. 4. Is "tooth brushes" the correct way to say that? Tooth brushers? Tooth breeshers? Maybe I should have re-worded the paragraph to say "a toothbrush" it was probably completely incorrect grammar. Oh well. 5. I'm not going all crazy over the royal wedding. However since I'm usually up in the early morning feeding a certain sweet baby I decided I would stay up (get up?) and watch it. It's history and I think it will be neat to say I watched it. I asked Luke if he would get up with me and we could pop popcorn and fix some snacks and watch it together. He said he would, if I promised to watch every NY Giants football game with him and I wasn't allowed to tweet or read blogs during the games. 6. I will be watching the royal wedding alone on Friday morning. 7. Luke and I are all about saving money right now (that's a nice way of saying we are poor) so Luke asked me to try and not go grocery shopping this week. Instead of feeling sorry for myself that I can't make a daily run to my favorite place EVER, Target, I decided to enjoy this time and learn to be creative. Every night for dinner I try and come up with some fancy concoction using ingredients in our home. I've been getting pretty creative. Just add "chef" to my resume. 8. I just realized my random thoughts are really long. This just should be titled "Random Paragraphs"
9. I would LOVE more than anything to go on a beach vacation with my two boys. I would love to rent a house, and relax by the beach under an umbrella while Luke read some leadership book and our baby slept and I sipped on a margarita. Mmmmm that sounds so nice. 10. It's weird to me that Eli doesn't talk. I feel like we talk to each other all day long. I'm in my 7th week of my maternity leave and I have enjoyed every single moment of it. I took 12 weeks off and they are flying by. I don't want to think about how fast the next 5 weeks will go. Most days I do a good job of letting Eli nap in his crib, but sometimes I just sit and hold him during naps and let him lay on me. I don't want to look back and be sad that I didn't hold my tiny newborn enough. I love when he is all cozy and nestled asleep on me. It is the best feeling in the world. Today was a dreary day. It wasn't raining but it was very dreary and yucky looking outside. I don't like getting out when it's cold and yucky, especially with a baby so I decided we would stay inside for the day. After bath time I put Eli in a fresh set of pajamas. I knew we wouldn't be leaving the house so I wanted him to be warm and cozy. He has started smiling at me and Luke lately. Not just a small "passing gas" smile, but a true smile that lights up his whole face. I was trying to get him to smile this morning so I could take a picture. It is hard work to try and get him to smile and then snap a picture really quick. Much harder than it sounds. When Luke got home from work I put dinner in the oven (King Chicken Ranch) and then went out walking/jogging in this dreary weather. I've started doing the Couch to 5K again. Last year I was able to work myself up to 3 straight miles of jogging. Which I realize for some people isn't a lot, but for me it's a pretty big deal. So now post baby I'm trying to work my body up to that again. For the record, running with a full supply of milk is not easy and kind of painful. Just saying. But not as painful as not being able to fit into any of my clothes. Just saying. It was pretty chilly outside and I kept thinking it was fall. So that was how I spent my day. It was a normal day but it was a great one! Our first Easter with our sweet baby Eli and it was a good day. Obviously we have to be at our church for Easter, so we invited both of our families to our church and then to our house for lunch. I have been stressing for awhile on what to cook for the day but ultimately decided on BBQ. Our church had an baby dedication on Easter so Luke and I dedicated to raise Eli in a Godly home and teach him the ways of the Lord. After church we attempted to get a picture of Maxton and Eli with their coordinating outfits... poor baby Eli wasn't too happy. I was so stressed about the day that it wasn't until now that I realized I never got a picture of Eli by himself in his outfit. I will do that later this week. I am so thankful for my little family of 3 and for my boys. The night before Easter I went to bed stressed about the next day, but woke up with a peace that can only come from Him. Too often I satan tries to distract us from the true reason for the day. I was worried about getting the food ready for everybody, getting to church on time, figuring out where to feed my child, other people, my family's safety on the road during the bad storms that morning, my new body and weight, etc, etc. But I decided to let it all go. For today at least. I hope everyone had a wonderful Easter. I had such a good weekend with my two boys. Fridays have become my absolute favorite day of the week. Luke has Fridays off so this is our day to just relax and hang out around the house. Before maternity leave I was always jealous when I had to get up and go to work and Luke was still nestled in bed (which I'm sure is how he feels on Sunday mornings) but now we get to hang out all day together with our little man. I love it. Friday morning after my early morning nursing session with Eli we all just hung out in bed. We watched a movie on TV and just spend the morning relaxing. Well actually we spent the whole day inside relaxing and getting chores done. It was a cold day (well cold for April, I think it was only 62 or something) and incredibly windy. I do not like to leave the house if it is cold and windy. So I didn't. I was giddy all day because Friday night was a very special night. It was the night that my favorite show of all time premiered for the season for the last time. Tear. Friday Night Lights is the show I am talking about. I have debated for awhile as to whether Lost or Friday Night Lights ranks as my favorite show of all time. It was a close call but I finally went with FNL (that's what us devoted fans call it). I obviously have big dilemma's in my life. My next biggest dilemma is deciding which group of Housewives is my favorite. Tough call. So Friday night I fixed a very special meal. Well I was planning on it. And then I remembered I have around 16 pounds to lose. So instead of fixing a tasty fried chicken parmigiana I fixed a tasty baked chicken parmesan. And had no dessert. Feel sorry for me. Dinner was very good and I plan to find a lot of recipes from that website. And of course the episode of Friday Night Lights was wonderful. I want to BE Tammi Taylor. Ok y'all? (only devoted fans will understand that, if you want to be in the know you need to watch it ASAP, best show ever). The rest of the weekend was very laid back. I spent a lot of time reading Water for Elephants and finished it by Sunday night. I never had any interest in reading it until I saw the movie preview and then I was intrigued. The book was great although I did have trouble picturing Robert Pattinson as Jacob but I'm anxious to see him in the movie. I'm sure he will do great though, I think he is an amazing actor (and that's coming from a team Jacob person). Whoa I just put it together that he is playing a person named Jacob in this movie. Ironic. (is that the correct use of ironic? I get confused about that). 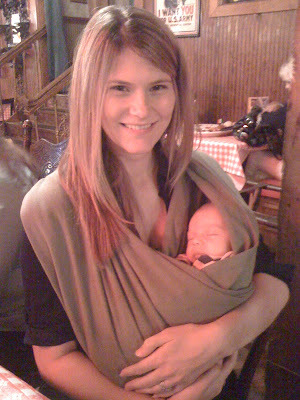 After church we went to eat with some friends and Eli slept the whole time. I loved getting back into the swing of things; church and then eating with friends. It was a great end to the weekend! Even though I'm sooooo tired, and have feelings of uncertainty about the future, and have days where the only thing I can smell is my regurgitated breast milk on my sweat pants that I've worn for two days I am so thankful for this season of life and for my little family of three. We make a pretty good team. Luke and I cannot believe that our sweet Eli is already one month old!! I think I just got a small glimpse of how fast this is all going to go. This past month was the fastest month of my life. - He is still in newborn diapers. We ran out of those so I tried using size 1's because we have a TON of those but they kept leaking. I just couldn't get them tight enough around his skinny little body. So back to newborn diapers we went. - We went to the doctor on Tuesday and he weighed 7 lbs 14 ounces and was 21 inches long. - He loves his vibrating bouncer. 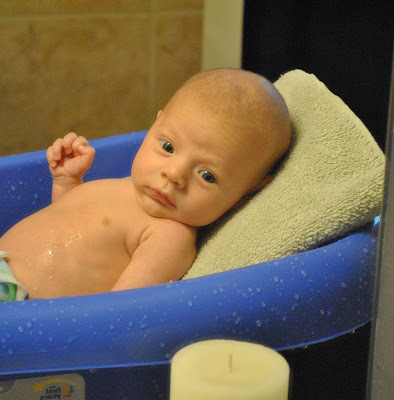 On days when I shower (which is not everyday now) I put him in his bouncer and he is calm and content. - He takes naps in his crib during the day and still sleeps in a cradle next to our bed at night. I have no idea when I will move him to his crib. Probably once he is sleeping through the night. - He is wearing all newborn clothes. I try and put 0-3 clothes on him but they are way too big! - He is very good in the car and usually just goes right to sleep. - We go walking everyday and he seems to like it. It relaxes him. - He is starting to like tummy time more. At first he hated it, but now he will look around for a couple of minutes before getting fussy. - I've stared putting him on his playmat and he seems content for a bit. It has a little noisemaker that lights up and he stares at that for a bit before wanting to be picked up. - He stays alert longer during the day and tries to talk to us. He will be "cooing" before we know it! - Eli and I have already gone on two small road trips in the past month. On Wednesday of this week we drove to my hometown. We had a full day! We lunched with friends, went to my mom's school so she could show him off to her teacher friends and students and then hung out at my parents house the rest of the day. It was a great day! 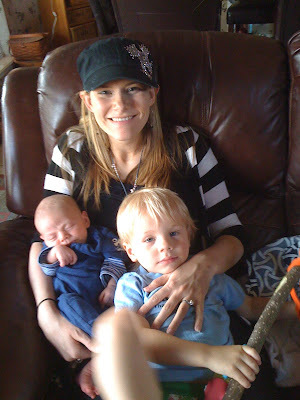 Here I am with my two of my favorite boys; Eli and my nephew, who is a happy boy but doesn't smile for the camera. It will be so fun to watch them play together one day! Well I haven't been blogging as much as I would like to lately. I was hoping that I would be able to blog more often during my maternity leave since I am at home all day but that hasn't been the case. When Eli is awake I want to spend time with him reading to him, or talking to him, or helping with his tummy time, things like that. Then when he is asleep I am running around cleaning, doing laundry, trying to get myself ready, or just things random around the house. I seriously can't get over how fast the days fly by! Plus I haven't had the best blog material. 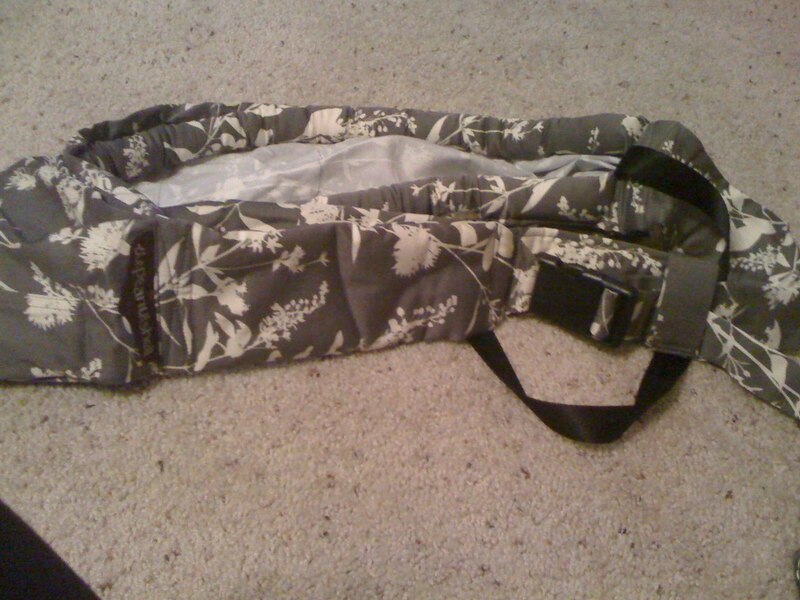 I thought about writing a post last week about my dilemma with finding a baby sling to use, but that's just boring. And then I thought about writing about how every person I was pregnant with is already back down to their regular size and I'm still 4 sizes bigger. FOUR. I'm having an emotional/mental/LIFE breakdown over here. But nobody wants to hear my whining. Monday through Thursday Eli and I hang out around the house. We play, he sleeps, I clean, we go on walks, run occasional errands, then Luke gets home around 6:00, we eat dinner, hang out as a family, and sometimes I will shower during that time, then we go to bed. Luke is home with us during the day on Friday's (since he works on Sunday's) so Friday's have become my favorite days. We all sleep in, well sleeping in has now become 8:30. Our favorite thing to do right now is to all lay in our bed in the morning and just talk to Eli. He has started trying to "coo" back to us a mimick faces we make at him (sticking out our tongues, etc) it is SO much fun to watch him learn and grow. This weekend I took Eli to church for the first time. It was so fun to be at church as a family of 3 for the first time. I tried not to be the crazy mom with a new baby...tried. Here we are at church. Eli slept the whole time: Luke thought it was funny/odd that I just wanted to hold that car seat up and not take Eli out. Umm he was sound asleep I was NOT disturbing that sleeping baby! And here are some random pics of Eli. I am SO bad about using my big camera for pictures. I usually just use my old school iPhone which isn't the best quality. I need to get better about using our fancy schmancy camera or I just need to get rid of it. I am going to try and be better about blogging this week! Our little baby is a month old and I need to do his 1st month post!! I feel like nobody properly warned me for the emotions I would experience after giving birth and bringing home my new baby. I'm not talking about the "oh my gosh I love this baby so much" kind of emotions. Everybody talks about those and seems to assume that every woman feels like that way when they get home from the hospital. I'm talking about the "What the heck have I done? When will my life feel normal again? Who is this little gremlin that I'm responsible for?" kind of emotions. 2. if you do experience these emotions, it is ok. It took several conversations with other mommies who have experienced those same thoughts, and reading lots of articles online (you know the credible kind) to realize that I'm normal. Well at least in this matter I'm normal. The first night we brought Eli home he cried every hour on the hour. We later figured out that he was probably cold that night, but at the time I had no idea what was wrong with this little creature. Yes I carried him for 9 + months in my belly but that doesn't at all mean that I knew him. He was a stranger in my room screaming and all I wanted to do was sleep. I can remember sitting up in bed that first night, trying to get my child to nurse instead of scream, and looking over at my husband who was sleeping so soundly I could practically see the visions of sugarplums above his head, and I thought "what did we do?" "we just brought a child into this world and we KNOW NOTHING ABOUT HIM"
It was in that moment that I longed to feel normal again. For 9 months all I talked about and thought about was this sweet baby growing in my belly. What he would look like, what our lives would be like when he came etc. etc. But I had no idea that my hormones would basically attack me and I would feel all of these raging emotions just a few short days after his arrival. THAT was not apart of my picture perfect plan! While shopping I ran into a friend. She was excited to see me out and about and said 'Hi! How are you doing?" I immediately started crying these huge giant tears. In fact I didn't even know that my body was capable of producing such large tears. While crying in the middle of Old Navy sandwiched between those creepy mannequins that I'm always afraid will start talking, I told her that I just wanted to feel normal again. I'm sure she immediately regretted asking her simple standard question of "how are you?" But in those first few days all I could think was "I just want to be normal again"
And for the record the fact that I wanted to feel normal again had nothing to do with my love for my baby. My love for him was unexplainable, but at the same time my whole life was now completely different and I was coming to terms with that. At first it was scary for me to be feeling these emotions. I went through many moments of wondering if I was wrong or a bad mom for just wanting to feel normal again. I didn't want to get rid of my baby, and I didn't want to re-write history but I did want to feel normal again. Now I'm not sure when it happened, or how it happened, but slowly and surely things have started to feel normal again. It seems like there was a time when hormone-hell subsided and things just started to click. It wasn't all at once, but there was a week where I could tell everyday I was feeling more like myself. It was around the time that I wrote a post about having a growing love for Eli. Because that is how it happens. Every day I love him a little more. I can't explain it and I don't know how it happens or how I'm capable of loving him more but I do. And not only do I love him a little more but I learn him more everyday. What his specific cry's or noises mean. What he looks like when he is fighting sleep. About what time he will wake up to eat. The moments when he's alert and the times when he just needs to sleep. I learn a little more about him each day. I've only been a mom for a month, and maybe it seems a little premature to be talking about these emotions so soon, but I already feel like I'm on the other side of it. I now realize that in those first few days I just needed to relax and know that life would feel normal again. I now truly see that those first few days were about survival. I was learning Eli and he was learning me. He was figuring out how to live outside of the womb for the first time and I was figuring out how to live with a baby for the first time. Complete survival mode. Before Eli came Luke and I did all the grocery shopping together. Even though there were times when we would have a knock-down-drag-out in the middle of the cereal aisle I loved our time of grocery shopping together. Yesterday, I got a call from Luke and he suggested to me that we go grocery shopping together that night. I was ecstatic. Well, maybe ecstatic is a big word to use for grocery shopping but I was happy. So that evening we went grocery shopping. Me and Luke getting into a fight in the cereal aisle because the man takes 20 minutes to choose one cereal, while our sweet baby slept in his car seat in the cart right next to us. We have added a new member to our grocery shopping days. No, it's not the normal it was, but it's our new normal and I wouldn't change it for anything. Goodbye hormone-hell. Please stay far away.